Here are some tidbits of information about some of American’s favorite pies. Pumpkins are vining annual plants that are part of the Cucurbitaceae or Cucumber family. They are actually winter squash named Cucurbita pepo with the oldest pumpkin related seeds found in Mexico dating back to between 7000 & 5500 BC. Pumpkins are grown on every continent except Antarctica but the traditional American pumpkin that we are familiar with is the Connecticut Field variety. Pumpkins produce both male and female flowers on each vine and are pollinated by honey bees. Apples are formally named Malus domestica and they are from the rose family of Rosaceae. The fruit is a pome, which is characterized by one or more carpels surrounded by accessory tissue. This tissue is the edible part and is useful in protecting the buried seeds. Apple trees were widely planted and seeds distributed by John Chapman who became known as “Johnny Appleseed”. This wide distribution of open pollinated seed helped to widen the choice of available cultivars in early America to over 8,000 of which 100 are grown commercially today. Ipomaea batatas or sweet potatoes belong to the Convolvulaceae family. It is an herbaceous perennial vine, with an edible long and tapered tuberous root. Though distantly related to the potato in the Solanum tuberosum family, it is not a nightshade plant. It was domesticated over 5,000 years ago in either Central or South America but is the staple food for many countries worldwide. For most of American history sweet potatoes were an important part of the diet but fell out of favor as people became more affluent during the middle of the 20th century. There has been a resurgence of popularity with the awareness of the rich dietary contributions offered by this humble plant. Disclosure: Facts were gathered from the internet especially Wikipedia. The question was posed as to why some Hellebore’s can be entered into Flower Show judging and others are rejected. Here’s the long answer. Understanding the botany of the Hellebore will help explain the answer to the Flower Show suitability. Fig. 1. Diagram of the botanical parts of a Hellebore flower. Photo courtesy of Monica Tehomolic. Sepals (A) normally form outside of petals as a protection and support of the bud and flower. There are usually 5 sepals, two outer, two inner and one both. A group of sepals is called a calyx. The stamens (B) are the male part of the flower and are made up of 2 parts, the long white filament and the anther that sits on top holding the pollen. There can be up to 150 stamens per flower. The stamens surround the female part of the flower, the carpel (C). Fertilization of the carpels can be by insects, bees or wind. Replacing the petal in the case of Hellebores are small nectaries (D) that sit at the base of the sepals and provide food for pollinators. They don’t last very long and are shed at the same time as the stamens when the carpels swell with what will become seeds. Fertilized Hellebores can seem attractive for quite a long time since the sepals are persistent and the swollen carpels (E) are distinctive. The sepals will tend to loose their color vibrancy over time however. 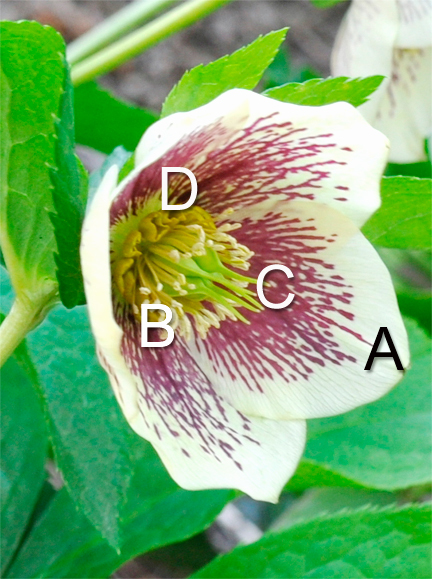 Because the Hellebore in Figure #2 is a fertilized flower, even though the sepals still appear fresh, this is not the stage when it is an acceptable specimen in a formal Flower Show submission. 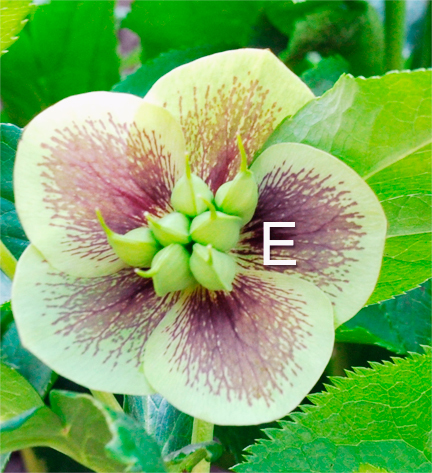 So, the short answer to the question of whether the Hellebore in Figure #2 is acceptable for Flower Show judging is: No, since the center is a fertilized seed pod. Early symptoms of leaf chlorosis and curling. 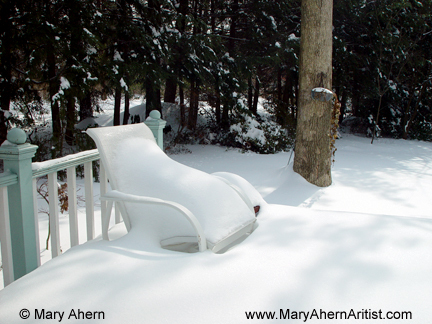 Photos courtesy of Margery Daughtrey of Cornell Cooperative Ext of Suffolk County NY. The backbone of the shade gardener’s summer display has been Impatiens for as long as I’ve been gardening (which is longer than I’ll post in a public forum. But that long starring role has come to an abrupt halt this year (2012) due to the infamous, Downy mildew fungal like disease caused by the pathogen, Plasmopara obducens. The symptoms caused millions of gardeners to drag out their hoses in attempts to combat the disease, which mimicked the appearance of water starved plants. This tremendous shake-up in the Horticultural industry has growers, breeders and chemists scrambling for solutions and workarounds. It isaffecting this billion dollar industry in big and small ways at a time when our economy is struggling. The gardener goes to the nursery to place part of their closely budgeted money to bring a season of color and happiness to their home. The nursery is in a seasonally based business & feels the pressure of cultivating new customers into the Art of gardening as well as taking care of their established base of avid buyers. Under competitive pressure these nurseries offer their customers plant warranties. It boggles the mind how a seasonal small business would be able to sustain themselves when a calamity like the collapse of the stalwart impatiens plants would affect their bottom line once the warranties start rolling in. One of the largest growers and breeders of Impatiens is right here on Long Island. Ivy Acres, located in Baiting Hollow, supplies a customer base not only on Long Island but also in New Jersey, Westchester County & Southwestern CT. They are the suppliers to the wholesale nurseries, so the chain of businesses affected continues up the chain of distribution. 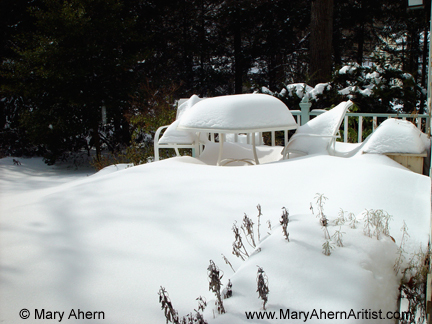 What does that mean for us, the local gardener? What that means is that there is immense pressure to bring to market disease resistant replacements for the annual market geared to shade tolerant plants. For the next few years we will be seeing a tremendous array of new opportunities and options as replacement plants are introduced into the Horticultural market stream.